A married Iranian couple who were once refugees at Nauru have left Cambodia and returned to their homeland despite the potential dangers, in a further sign Australia's $55 million deal with the south-east Asian nation has failed. The office of Immigration Minister Peter Dutton confirmed the development on Tuesday, but said Nauru refugees were still encouraged to move to Cambodia. It means Australia has paid Cambodia $55 million to permanently resettle just two refugees - striking a further blow to the much-maligned deal. "How can Cambodia take refugees better than Australia," asks a protestor on the streets of Phnom Penh, as Scott Morrison firms up the government's deal to send asylum seekers to the poor nation. 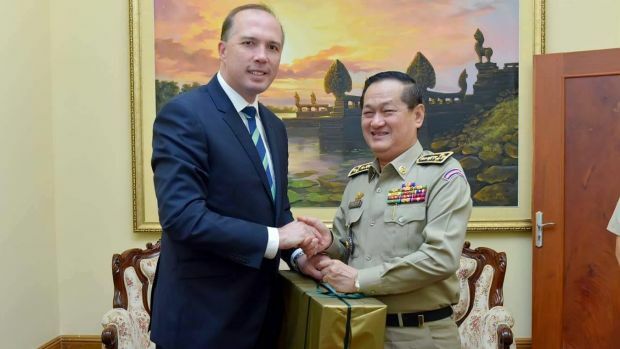 Australian Immigration Minister Peter Dutton with Sok Phal, director of the Cambodian Interior Ministry's immigration department last year. Labor's immigration spokesman Richard Marles said the deal had been "botched" and reflected the government's "abject failure" in dealing with asylum seekers. "Not only has this government wasted $55 million of taxpayers money on this dud deal, they have also left more than 2000 people on Manus and Nauru in limbo for nearly three years on their watch," he said. "The inability of this government to secure a meaningful resettlement arrangement with a credible third country is a serious failure on the part of Malcolm Turnbull." The government argues that the asylum seekers and refugees in offshore detention are a legacy of the former Labor government, and it has stopped unauthorised boat arrivals. The Turnbull government has been seeking third countries in which to settle refugees from Nauru, after Australia refused to accept them. Nauru has offered refugees only temporary resettlement. A spokeswoman for Mr Dutton said refugees "can elect to return to their country of origin at any time, which is what an Iranian couple in Cambodia decided to do recently". "The government remains committed to supporting the government of Cambodia to implement settlement arrangements in Cambodia and encourages refugees temporarily in Nauru to explore this settlement option," she said. "The government holds firm on our policy that you if arrive by boat then you can either return to your country or origin or be resettled in a third country." As Fairfax Media reported last week, the federal government says two gay refugees reportedly bashed at Nauru, where homosexuality is illegal, should take up the Cambodian resettlement deal. The first group of four refugees arrived in Phnom Penh in June last year at a cost to Australia of $15 million, on top of $40 million in increased aid that Australia gave Cambodia to sign the agreement. However one of those refugees returned to Myanmar. The departure of the Iranians leaves just one from the original group remaining, plus another who arrived last November. Critics say Cambodia is not a suitable place to resettle refugees because it is impoverished, has been accused of human rights abuses and has no refugee resettlement experience. Mr Dutton was forced to fly to Cambodia in September last year to salvage the controversial deal, after a Cambodian official declared the nation had no plans to resettle more than the four refugees who had so far arrived. News outlet Cambodia Daily has reported comments by Sok Phal, director of the Cambodian Interior Ministry's immigration department, as saying the Iranian couple "wanted to return back home. You ask me why, I don't know". General Phal reportedly said he was not aware of any efforts to guarantee their safe return, and that no other refugees on Nauru had volunteered to come to Cambodia since the Rohingya man in November. Refugee Action Coalition spokesman Ian Rintoul said the Iranian couple's departure was "the final nail in the coffin of the Cambodia deal". "People were only going to Cambodia as a way of getting off Nauru and as a way of getting somewhere else," he said. Mr Rintoul said despite being found in genuine need of protection, the Iranian refugees may have decided to "take their chance" on returning to their homeland because Cambodia did not offer them education or work opportunities, language training or potential for family reunion. They may also have returned home with plans to migrate elsewhere, such as Europe, he said.